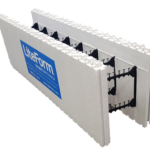 Pre-assembled ICF “Block” forms for single story or multi-story residential or commercial projects. Flat, monolithic cavities accommodate all rebar requirements. Continuous polypropylene fastening strips, pre-molded corners and exclusive accessories make set-up and bracing quick and simple. High density packaging reduces shipping and handling costs up to 50% (when compared to rigid ICF systems). Full hardware packages are available to build virtually any wall shape. 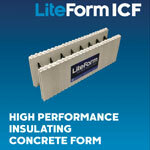 LiteForm forms are designed to reduce the rising cost of shipping, CO2 emissions and job site space. The only way we can offer these savings is with our patented folding forms. LiteForm’s folding design dramatically reduces shipping cost and job site space by 55%. 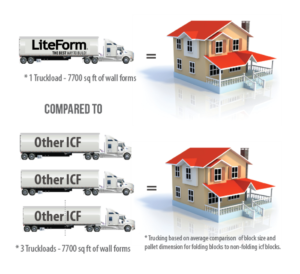 One single truckload of LiteForm ICF’s = 7,700 sq ft of wall forms compared to other non folding ICF’s that typically fit only 3,500 sq ft of wall forms per truck. 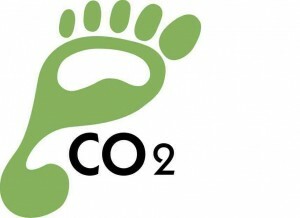 These building components reduce the carbon output and environmental impact without sacrificing superior strength and performance.